Your Guide to Master Yoga Poses while calming your mind, be stress free, and boost your self-esteem! Yoga is a belief that a man’s mind, body and spirit should work in harmony with the environment and his own self. To achieve this, his emotions, actions and intelligence should all be in balance. Some who are not familiar with yoga think that it is an exercise composed of poses that are also impossible to do. This is why some people become rather hesitant about practicing it, or even trying it. Though it may be true that some poses require impressive flexibility, there are many poses that can be done by beginners or those who are still inflexible. 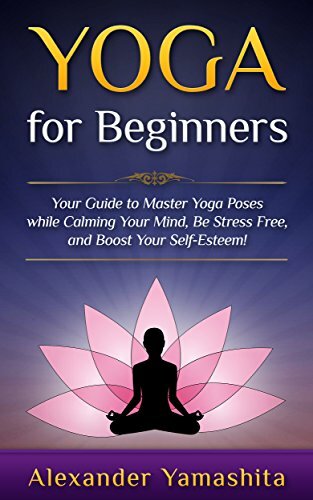 With this book, you will learn everything about how to begin practicing Yoga. It will teach you some basic techniques on how to prepare your body, mind, and spirit. It will teach also teach you how to slowly achieve the flexibility needed for advanced poses – in a safe, gradual way (rushing things won’t be beneficial in this kind of self-improvement pursuit as doing so will only lead to injury). The book will also include basic sequences of poses, which you can use to create an exercise routine. You’ll also discover what you need to learn about the essentials of yoga. In other words, you’ll know exactly what you should prepare (such as mats and straps) before starting a healing exercise that can help you achieve a balanced and calm mind, spirit, and body. In addition, you will know the proper attire for doing yoga – the sort of clothes that you’ll be able to move in. If you’re worried that you’ll only get to read about beginner-level poses and routines, you will be glad to know that this book also serves as a preview on the more advanced side of yoga. After all, most beginners eventually yearn to try something more challenging. To achieve a proper balance between enthusiasm and safety, several tips are also provided for those aiming to become advanced yoga practitioners. As you might have heard, diet is also an important aspect of this mind-calming, stress-reducing, and confidence-boosting endeavor. That’s why this book also features an entire chapter dedicated to proper yoga nutrition. It won’t be strict diet though, as you will only be taught how to food items that could help you reach your goal. Of course, that also means you’ll become more familiar with those that won’t do you any good.